Chez Panisse opened its doors in 1971. Founded by Alice Waters, the restaurant is rooted in her conviction that the best-tasting food is organic, locally grown, and harvested in ecologically sound ways by people who are taking care of the land for future generations. The quest for such ingredients has always determined the restaurant’s cuisine, and over the course of 40 years, Chez Panisse has helped create a community of local farmers and ranchers whose dedication to sustainable agriculture assures the restaurant a steady supply of fresh and pure ingredients. 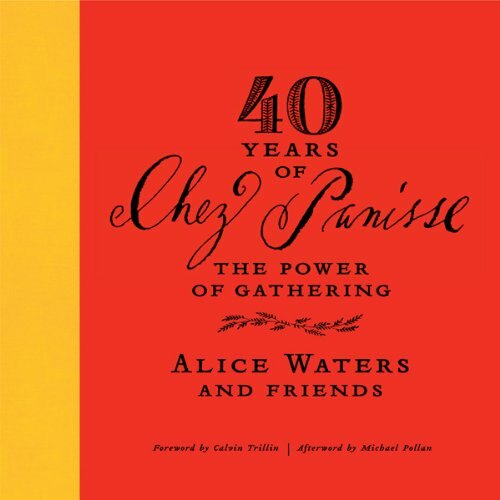 In Forty Years of Chez Panisse: The Power of Gathering, Alice takes listeners on her journey from the humble and visionary beginnings of the restaurant, through its rise and the acclaim, to the Café and the influential Chez Panisse Foundation. Organized by decade, the audiobook includes a wealth of archival material - menus, invitations, and interviews from public figures and cooks who have been inspired by or mentored at the restaurant. This tribute to the delicious food revolution that began with Alice Waters and Chez Panisse is an important work for anyone who cares about food, sustainability, and the powerful legacy that Alice has built.